Mix the flavored vodka, liqueurs, strawberry puree and ice into a cocktail shaker and shake until well blended. Pour into shot glass. Fill decorating bag with frosting and carefully frost the rim of the glass. Serve and enjoy. To say cupcakes made a comeback is a serious understatement. Not only did they amp up the cuteness level to 11 on party dessert tables everywhere, cupcakes got a whole new attitude. From wine-inspired flavors to double rainbow deliciousness, it's safe to say the cupcake has been just ruling. Even the liquor industry fell under its sweet, sweet spell...cake and frosting flavored vodkas are popping up everywhere! 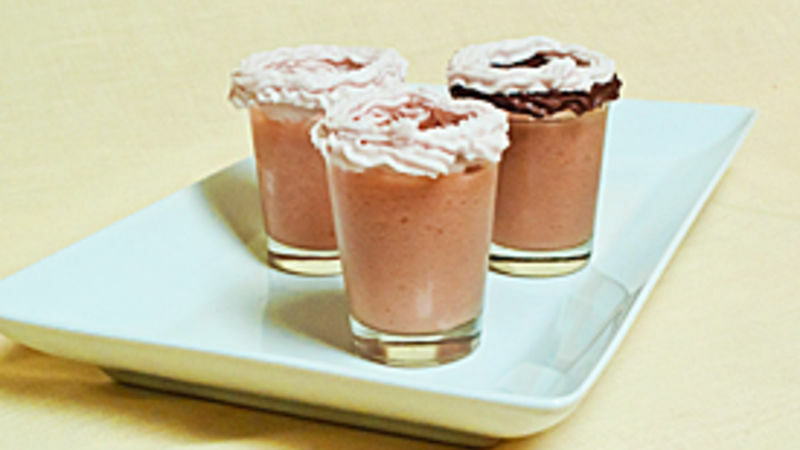 Which leads to my latest try-it-cause-you-just-might-like-it creation, the Strawberry Chocolate Cupcake Shot. Now a word to the wise before we begin, while these may look all sweet and petite — they really pack a punch. So take it easy.